NES The Adventures of Bayou Billy (USA) in 16:07.77 by xipo. 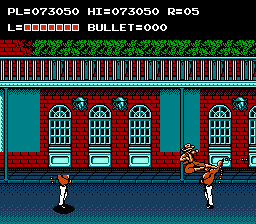 The Adventures of Bayou Billy (1989) contains a trinity of genres: beat 'em up (like Streets of Rage), sniping (like part of Golgo 13), and car racing (like Rad Racer). In the game, "Bayou" Billy West fights his way through Louisiana en route to New Orleans in order to save his kidnapped girlfriend, the luscious Annabelle Lane. The American version of this game is a lot more difficult than the Japanese one (Mad City), although this video makes it seem easy.